Special Learning, Inc. launches their newest eBook designed to provide those seeking information on “ABA Therapies” with a comprehensive overview of the most effective and proven ABA treatments. This eBook covers the ABA therapies most widely used to support social, communication and emotional development in individuals with Autism. 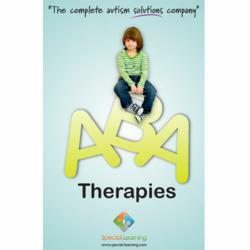 Special Learning, Inc., an online comprehensive Autism solutions company, today announced the launch of their newest product in their line of downloadable eBooks, entitled “ABA Therapies." Since Applied Behavioral Analysis (ABA) interventions began showing tremendous success in increasing desirable behavior and decreasing problematic behavior in children with Autism, numerous ABA techniques have been developed to address almost any learning challenge or situation. This eBook helps parents and therapists evaluate the most effective ABA techniques and decide which ones work best in a given situation. When it comes to choosing the right ABA programs, independently or with the guidance of teachers and therapists, this Special Learning eBook will ensure you are well informed and able to make the best decisions for your child with Autism. Which ABA therapies you choose depends on many factors. Is your child working on broader foundational developmental capacities, or focusing on discrete skills and behaviors? Will the learning take place at home, school, or elsewhere? What level is your child at in the targeted skill or behavior? Special Learning has designed this eBook to help you understand how various ABA treatments can meet the varying needs of the student with Autism. Each ABA therapy is broken down into easy-to-follow components. For each therapy, you will learn about its benefits, in what situations to apply it, how to set up the teaching environment, and step-by-step instructions on how to use it. Special Learning’s goal for this eBook is to quickly and effortlessly expand your knowledge and repertoire of ABA therapies. The alarming rise in the prevalence of Autism and other developmental disabilities in children has necessitated the need for parents and educators to seek reliable information about these conditions. Many are at a loss in identifying and addressing the needs of these children due to a lack of knowledge about their nature, strengths, weaknesses, skills and impairments. Available research articles use technical jargon that individuals not adept in Special Education find difficult to understand. Apart from theoretical knowledge, parents and educators need more actionable material to guide them in dealing with their children with special needs. With the release of this new product, Special Learning, Inc. continues its mission to make a positive impact in the lives of those individuals affected by Autism across the globe. Special Learning is dedicated to becoming the global leader for Autism and Applied Behavior Analysis (ABA) solutions by leveraging technology to offer every person diagnosed with Autism Spectrum Disorder (ASD) the opportunity to attain an abundant and fulfilling life. Through their comprehensive information and resource portal, Special Learning provides the global Autism community with a broad range of free products, tools and services. Its comprehensive product line includes ABA training & education products, iPhone and Android Apps, web-based & downloadable tools, and professional services designed to empower parents, teachers and providers so that they can help individuals with Autism move up the skills spectrum intuitively, successfully and affordably.